Stone Cold's part of the first wave of Mattel's WWE Legends, a line focusing on retired WWE Superstars in their trademark attires. 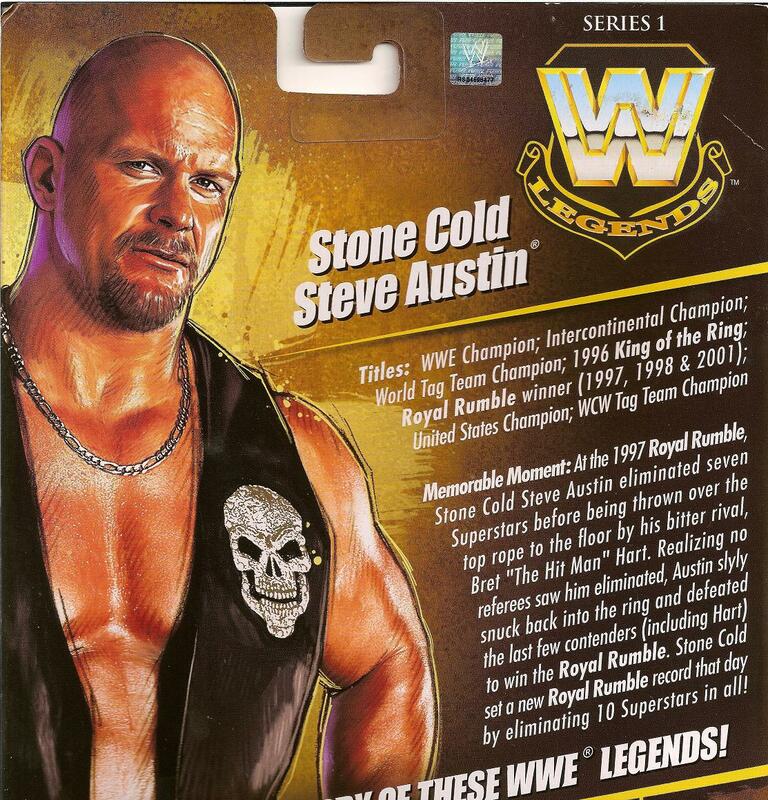 This figure captures Austin early in his rise to the top of the "Sports Entertainment" world. I'll admit he was one of my favorites, probably the favorite for several years. I followed his exploits on WWE TV weekly and was excited as all hell to see him deliver the "Stone Cold Stunner" on his opponents or anyone foolish enough to tangle with the B.M.F.'er! I'm assuming Mattel is still using the digital scanning process offered by Gentle Giant to sculpt these, despite SCSA being a "legend", he's readily available for WWE appearances, or 3D scans. He's captured here with a Stone Cold stare, probably a result of his famous motto, "Don't Trust Anybody", or "DTA." Austin is a rather generic looking wrestler. He's about average height for a pro-wrestler, he's bald, only wears black trunks, black kneepads with a brace on one leg (later he wore two and later-er (?) he wore two red braces), has short black boots and that's pretty much it. He seems to have a new torso sculpt. It's about the same size as the Elite Batista or Triple H torsos, but not as toned. I think this torso would have benefitted the DiBiase (Jr) and Randy Orton figures, too. However, the neck seems a bit too large for Austin, since his neck isn't that wide. He definitely has new lower leg sculpts to accomodate his smaller boots which appear to be new to the line as far as I can tell. 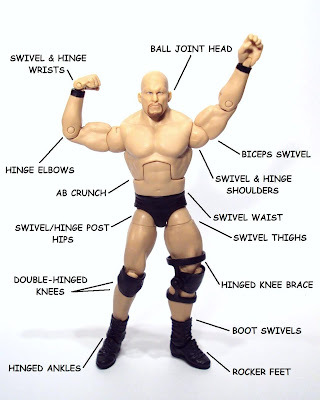 The kneepads and knee brace are separate pieces that fit over his legs, pretty much a standard feature on all Mattel WWE figures. There's not much paint on Stone Cold. All of the pieces that form him are molded in the appropriate color. Paint is added to his face for his eyes and goatee, but the application on his right eye was botched and it appears larger than the left one. He also gets some black paint on his forearms to recreate his wrist tape. That's something that's bugged me since Mattel released their WWE products. It's not a huge deal on Austin because he just uses the tape on his wrists and it's black, so it looks okay when you look at the figure as a whole. I understand it would be too expensive to create individual forearm sculpts for each wrestler just for their arm tape, but it bugs me quite a bit. I feel they can do something else to make it look more authentic. I'll let Mattel know if I come up with something. Steve has one visible tattoo and that's of the state of Texas on his left calf. The printing is sharp and the color is bright enough to stand out just like the real thing. As I remember it, the city of Austin is marked on the tattoo, but the figure has a cattle skull over the state of TX. Several of the Elite figures feature really detailed tattoos including lettering, so I know Mattel's able to do it on the technical side of things. I'm not sure why they made that switch, unless it's something he updated on his tattoo. Thankfully, the Legends line features the same articulation as the Elite Collection, allowing this Austin to fit right in with those figures. The diagram above displays the various points of articulation across Steve. His head motion, at least up and down, is restricted by the exaggerated girth of his neck. The ab crunch has better range than several of my Elite Collection figures, mainly the backwards motion. Also, Steve's able to achieve a full 90 degree angle at his hips, another improvement over my Elites, but the joint on the left leg is a little tough to manipulate. It may be the result of a softer plastic used on the peg connecting the pelvis to the leg. The smaller kneepads allow unrestricted motion of his dual-hinged knees, but the hinged knee brace on his left leg doesn't share the fluid motion the knee joints have. The brace is made of a soft plastic and will actually bend, so there's no fear of it breaking. Like the rest of Mattel's WWE lines, the Legends series includes a stand and name tag with each grappler. 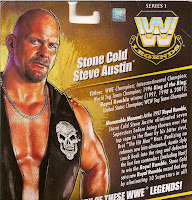 In addition, Stone Cold comes packaged with his trademark vest that he wears on his way to ring prior to a match. It's molded in one piece from a soft plastic and you can remove it pretty easily. All the details are painted on in silver with gold to highlight the "riveting" across the vest. All the letters, numbers and logos are crisp and look excellent. Mattel also included his "Austin 3:16" t-shirt he can wear alternatively to the vest. It's made of a soft cloth with a velcro strip down the back, that eliminates any logos printed on the backside of the shirt. I like the fact they include t-shirts with these figures, it's a nice touch that adds to the authenticity. They don't look great on all figures, but Austin can sport his and look cool thanks to his bulkier torso.